The Junior High Academic Decathlon is a competition for students in grades 6-8. There are ten events. Two are collaborative team efforts – a logic quiz with 20 rigorous thinking problems, and a super quiz with 50 multiple choice questions on five broad academic themes. The remaining eight events test individual knowledge of the Roman Catholic doctrine, English, Literature, Science, Mathematics, Current Events, Social Studies, and Fine Arts (Art and Music). Awards are given for individual and team performance, and the winning school team from each geographic diocese competes in a state championship. For an incredible 11th year in a row, St. Ignatius Parish School is the Sacramento Diocese Academic Decathlon Champion. 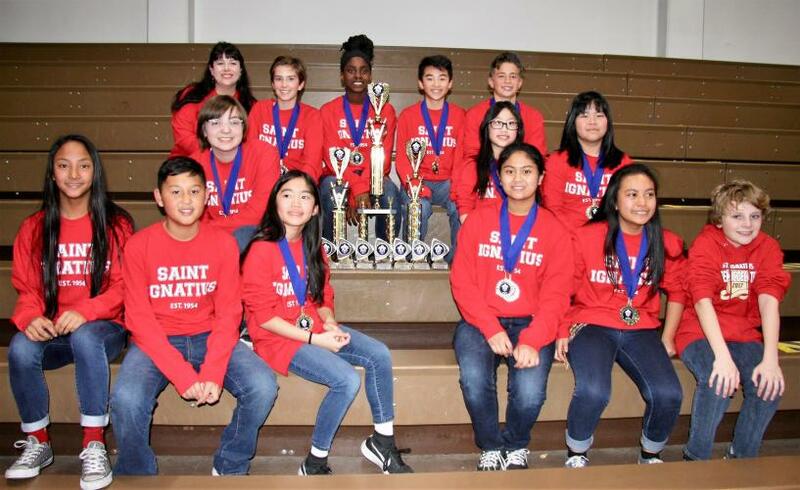 We are so pleased to announce that for a record-setting tenth consecutive year, St. Ignatius Parish School was the Diocese of Sacramento’s Junior High Academic Decathlon Champions. The team, comprised of sixth, seventh and eighth graders, went on to place third at the statewide decathlon championship, which was held this year at Sacred Heart School here in Sacramento. Congratulations to the 2017 St. Ignatius Academic Decathlon Team! Congratulations to our amazing Academic Decathlon team. They competed against 22 Diocese schools and won their 10th Diocese Championship. 1st Place in Super Quiz! We are so pleased to announce that for a record-setting ninth consecutive year, St. Ignatius Parish School was the Diocese of Sacramento’s Junior High Academic Decathlon Champions. The team, comprised of seventh and eighth graders, went on to place third at the statewide decathlon championship, which was held this year at St. Edward the Confessor School in Dana Point. No other school in the 27-year history of the event has achieved this unprecedented success. For a record-setting eighth consecutive year, St. Ignatius School in Sacramento placed first in the Diocese of Sacramento’s Junior High Academic Decathlon on March 7. The team, comprised of seventh and eighth graders, will represent the diocese at the statewide decathlon championships on April 18, which will be held this year at Sacred Heart School in Sacramento.No other school in the 26-year history of the event has achieved this unprecedented success. The St. Ignatius Academic Decathlon team won their 7th Diocese championship this past weekend. The team placed first in logic and first in the super quiz. In addition Peter Sutarjo placed first in Religion, Todd Russell placed first in Science, Alex Bonilla placed first in Social Studies, Cade Johnson placed first in Current Events, and Saunder Salazar placed first in math. Tony Arostegui placed second in Fine Arts, and Andrew Tilton placed second in Literature and Claire Russell placed third in English. These are to be turned in after the first trimester progress reports are published (late September).